I’ve been wondering whether a backlash would develop against the Democrats’ crazed, ceaseless attacks on President Trump. No one has ever seen anything like it: the ridiculous smears, the nightly barrage of television “comedy,” over-the-top attacks by former government officials like John Brennan and James Comey, endless investigations into nothing in particular, calls for impeachment (grounds? who needs grounds? ), absurd accusations of “treason,” and so on. It is unprecedented in American history, and maybe voters are starting to think the Democrats have gone too far. No doubt the Democrats’ constant attacks, amplified every day by the press, have an effect. But at a minimum, diminishing returns seem to have set in. 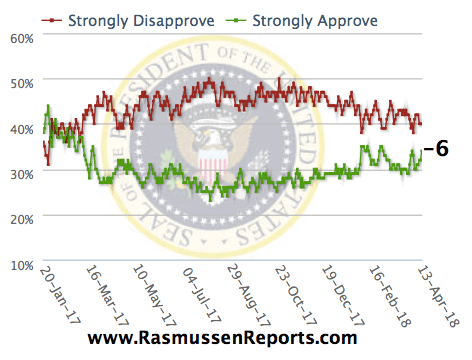 Today’s Rasmussen survey, the only daily presidential approval poll now functioning and the only one, to my knowledge, that currently surveys likely voters, finds President Trump with 50% approval and 49% disapproval. His approval numbers this far in 2018 are essentially identical to President Obama’s ratings at the same point in his administration, notwithstanding Obama’s fawning press coverage. Equally interesting is that Trump’s “Approval Index” is narrowing. 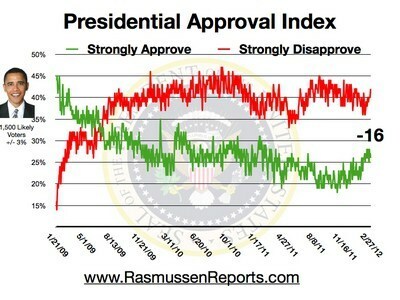 Rasmussen’s Approval Index, which we wrote about a number of times during the Obama administration, is the difference between the number who strongly approve of the president’s performance, and the number that strongly disapprove. Obama’s Approval Index was often very low, -20 or worse. President Trump’s Approval Index has been dismal at times, too. Currently, however, Trump’s Approval Index stands at -6, and improving. The number of voters who strongly approve of the president is rising, while the number who strongly disapprove is falling. This seems paradoxical in light of the insane hatred that is unleashed against President Trump on a daily basis. I suspect that part of the explanation, at least, is that some voters have figured out that the Democrats are crazed and are reacting negatively to their extreme tactics.